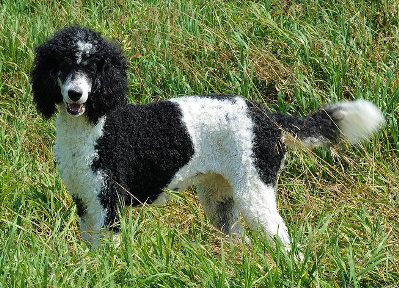 Coco is a stunning black-and-white Standard Poodle. As littermate and big sister to Valentino, she has been a great role model. Although they are grown up now, he continues to look to her for leadership. I believe Valentino is the confident, social boy he is today because of Coco’s good example. As for Coco herself, she’s the life of the party! Playful, loving, affectionate, confident and social, she is great with all the other dogs, the staff and visitors. 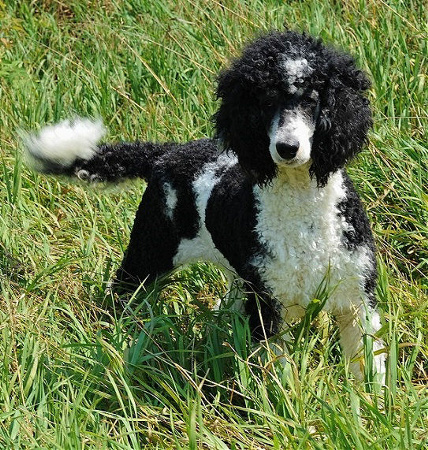 She enjoys any opportunity to strut her stuff and has the poodle prance down to a fine art. It’s fun to watch her tease the males with her charm and good looks. This dog exudes charisma and positive energy. She’s also highly intelligent, picks up any command easily and is very eager to please. Coco is the “total package,” and a fantastic mom to boot. What an asset to my breeding program! I purchased Coco from a reputable breeder, and am pleased that she comes from a line of well-bred, health-tested parents.